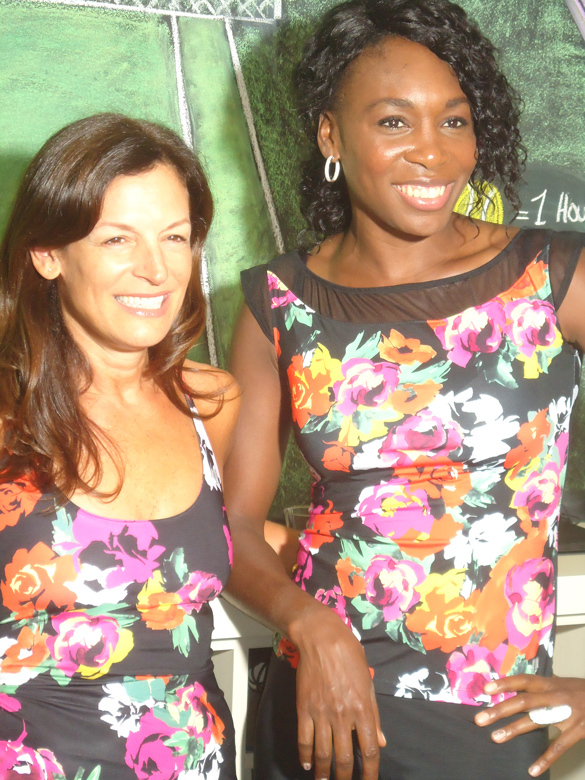 Every once in a while I get an assignment from Fit Bottomed Girls that makes me squeal with delight, but when I was given the chance to take a special Flywheel Sports class with co-founder Ruth Zuckerman and her special guest tennis ace Venus Williams? Well, as we say in New York — forget about it! I danced around my office in pure joy! Venus is more than just a rock-star athlete — she is also an entrepreneur with both an interior design business (V Starr Interiors) and her “performance first” fashion line EleVen by Venus. The event at the Upper West Side location was in celebration of new items of EleVen by Venus being available at select Flywheel Sports locations (Upper West Side NYC, Charlotte, South Lake Union Seattle and Gold Coast Chicago). Arriving at the studio, I immediately saw the bright fall colors of Venus’ latest EleVen line — so pretty and upbeat! Just as with other fitness studios in New York City (my apologies if I sound like a moron — I only take classes here! ), there is a “vibe” that you can feel right away as you walk in. Either scary (“This class will be too intense for you!”) or excited (“Oh hey — come on in and join us.”) At Flywheel, it was the intense “Yeah buddy, we are indoor cycling today!” feel that even though I am an instructor, made me feel a bit apprehensive. I grabbed my camera and managed to get this shot of Ruth and Venus chatting before starting our class. Then we were off! Venus picked the first song (“I Don’t Care” by Icona Pop) and pedaled along at a languid pace for a few minutes — and then she was off and out of the room (in a very graceful and elegant way, of course.) When you are in town in to participate in the U.S Open, cycling classes will have to wait!